Just Another Day...: 30 1/2 Weeks! Wedding rings on or off: Still on! Woot! Energy level: Tired. A lot. Very often. Like, all the time. You get the idea. Weight gain: Like 20 pounds. Argh. And my little guy is supposed to start gaining like 1/2 a pound a week! And I've still got 9 more weeks to go! Do that math! Yikes!! Mood: Excited! I know God has a perfect plan for our son, and we are totally committed to Him and are trusting in Him every step of the way! 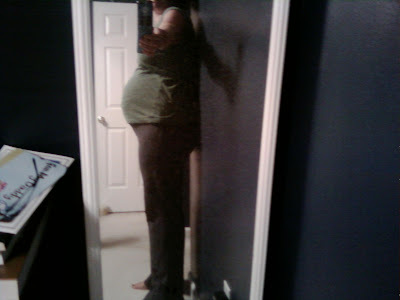 Size of baby: At our appointment last week, they told us he already weighs 3 pounds, 6 ounces! Woot! According to BabyCenter, he's about 15.7 inches long now, and she weighs almost 3 pounds. We've got an overachiever on our hands! This is especially good (concerning his weight) since we really want him to be as big as possible when he's born (although I'm not sure I'm looking forward to the "being born" part). His big sister was 8 lbs. 13 oz. at 40 weeks when she was born, so I'm guessing he'll be at least 8 lbs. when I'm induced at 39 weeks. Baby's changes: His senses are fully developed, so he can taste, touch, hear, see, and smell everything that's going on around him. He continues to practice breathing by inhaling and exhaling amniotic fluid, which may mean he gets the hiccups more frequently now (this is definitely the case!). Next appointment: We have an appointment at MUSC on Tuesday morning. We get to meet with the Pediatric Cardiology team at 8:00 AM, which will include an ultrasound/echocardiogram, then head over to "Prenatal Wellness" area (a.k.a. OB dept.) at 10:30 AM for another ultrasound and a meeting with an OB doctor. The following week, it's Dr. Greig (the fetal maternal specialist) and the week after that, it's Dr. Horne (the Pediatric Cardiologist) again. Not to mention another regular ol' OB appointment in 3 weeks. Whew! What I've been up to: Still desperately trying to locate a furnished rental property while we're in Charleston for Chase's birth, surgery and recovery. It's turning out to be much more difficult than I thought it would be! I mean, really, it's off-season, people. These property owners should be jumping at the chance to have 2-3 months of rent pouring in during the off-season! Ugh. Apparently that isn't the case. We see 2 properties on Monday so I'm hopeful one of them will work out. The only downside is that they're both 2BR rentals, and we really need a 3BR. But we'll have to make it work -- whatever we can find!